If you’re thinking of creating your very own outdoor kitchen, then you’ll need a great drop-in grill at the center of it. We think that natural gas makes the perfect fuel if you’re thinking of investing in a grill for your outdoor kitchen. The ability to keep cooking without the need to periodically change tanks of propane is the single biggest selling point of natural gas. It takes away any worries and allows you to continuously and effortlessly grill as much food as you like. Not only this, but buying a built-in grill can give you access to a huge range of features, from simple hood lights to infrared burners and rotisserie systems. 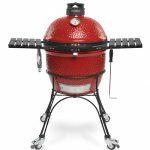 We’ve reviewed some of the best natural gas grills on the market to help you find the best built-in grill for your outdoor kitchen. If you’re not quite sure what a natural gas grill is, then we’re here to help. A Natural Gas Grill is the ultimate grill for your backyard. They are usually large, versatile grills that make a grand centrepiece to an outdoor kitchen. Natural gas grills are very similar to standard liquid propane grills but are different products, they are not interchangeable. Despite this, they both cook very similarly, having similar pros and cons to their actual cooking abilities. They cook very evenly and their temperatures can be controlled as easily as your indoor oven. Natural gas grills start up very quickly, their ignition process is very simple and effective, usually using similar processes to propane grills. Where natural gas grills are different to standard propane is where the gas is stored, how it is transported to the grill and how it burns. Standard propane grills require bottles of gas, whereas natural gas is supplied from a natural gas line. This means that some infrastructure may be required to install and use a natural gas grill in your outdoor kitchen. Natural gas will generally burn much cooler that propane, this means that it burns cleaner and will likely leave less potential soot than propane. It can also be much cheaper, depending on your area. Read our next section to learn the detailed pros and cons of upgrading to a natural gas grill or head over to our list of the best propane grills under $300 if that’s more of what you’re looking for. A built-in natural gas grill will be the best grill you ever buy. They tend to be incredibly well made, have a huge range of features and will cook cleaner and more efficiently than anything other grill. You will never run out of fuel. Even during huge BBQ cooking sessions you’ll never have to stop to replace the used fuel. Natural gas grills. Controlling the temperature of natural gas grills is just as easy as it would be on an indoor oven. They maintain temperatures very well and can very accurately hold the exact temperature you’re looking for. Natural gas burns very clean so you’ll get no soot deposits on your food. Natural gas is generally cheaper than propane. Using Natural gas is considered environmentally friendly. Due to the huge range of features and superior build quality of built-in, natural gas grills they tend to be much more expensive than any other type of grill. Not only this but you’ll need to build up the rest of the kitchen. Depending on what you want this can sometimes cost several thousands of dollars. If you don’t already have a natural gas line you will need one. This is going to cost more money and you will require a gas specialist to take you through your exact requirements. Depending on where you live you may need a permit or might not be able to use natural gas grills at all. We highly recommend researching a lot before taking the plunge. Your grill will (obviously) be in one location, they are therefore not portable. Built-in natural gas grills are a premium product, and you can expect to spend a premium to buy one. 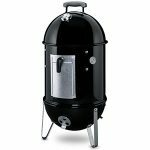 If you’re looking for super low budget built-in grills you’re going to have a hard time finding one that is worth the money. Even the best natural gas grills under $1,000 will likely not have the same build quality or number of features that a built in grill does that costs more than $1,000. Here at King of the Coals, we don’t believe in recommending poor quality products just for the sake of covering all the bases. We’ll be open and say that the low budget natural gas grills that we have chosen today are both over $1,000 due to their superior build quality. 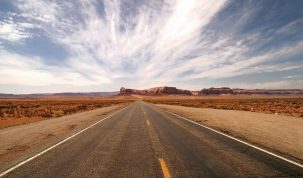 If you’re on a really tight budget there are options available but generally you’re going to be struggling to find anything that lasts unless you’re willing to spend quite a lot. 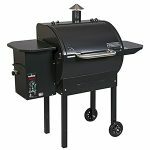 Check the latest range of built in natural gas grills under $1,000 on Amazon. The Bull Lonestar Select takes a lot of the best features of the most expensive grills and offers them in an affordable and incredibly well built package. 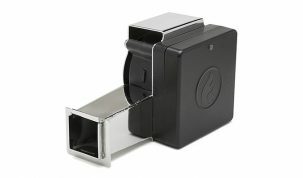 It’s fully made from 304, 14 gauge stainless steel which gives it strength and durability. The hood is a dual lined, single piece of metal with an insulation layer. This means that it has great heat retention and as it’s dual lined the outer part of the hood will suffer a lot less discoloration. With a total main cooking area of 810 square inches you can be sure that this will comfortably handle most of your cooking needs. 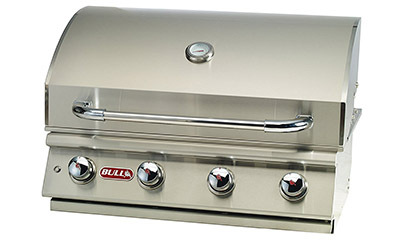 Overall, the Bull Lonestar Select is one of the best grills you can buy today. It’s built like a tank and will make a great centerpiece to your outdoor kitchen. 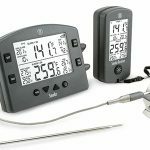 The thermometer isn’t the most accurate and has a tendency to haze over, which is why we’d recommend picking up a digital meat thermometer as well. Apart from that there isn’t much we can say that we dislike about the grill. It’s amazingly well built, has a huge cooking area and is incredibly easy to use and clean. You can’t go wrong with the Bull Lonestar and we think it’s the best budget built in grill for the money. 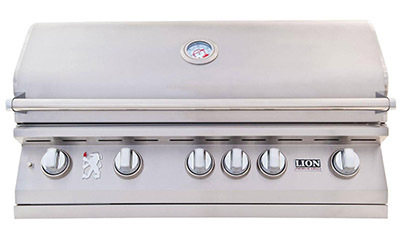 Lion Premium Grills have been helping to bring down the price of built in grills for a while now. 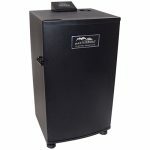 Their products have most of the features and build quality of the very best grills out there but for a fraction of the cost. For example, the L75000 series has a complete stainless steel construction, with a dual lined lid and stainless steel cooking grates. 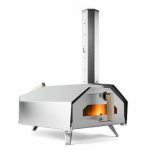 It has 830 square inches of cooking space and even comes with a rotisserie system, including a ceramic, infrared back burner, a stainless steel motor and a spit rod. 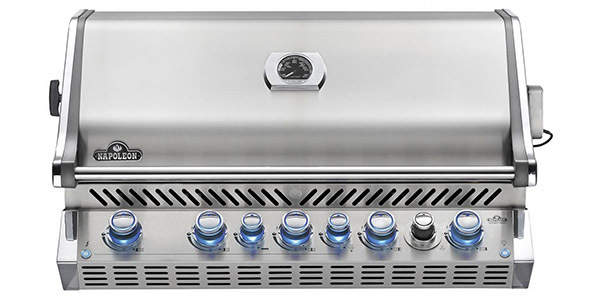 Overall, the Lion L75000 series of grills provides one of the best value packages that money can buy. You get a great size cooking area, a good quality build and a huge range of extra features that would normally cost you many times more. 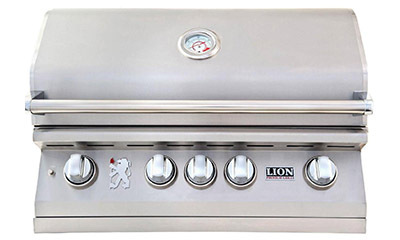 For the best mid range natural gas grills, we’ve got another Lion Grill. This is the bigger brother of the L75000 series and has a total of 1030 sqaure inches of cooking area. It still has the same build quality and all of the same features as the one before but what this one has that makes it stand out is the huge cooking area and the 6 burners. That gives you a total of 90,000 BTUs. The 6 burners are made up of 5 cast stainless steel burners that create the main cooking area and a ceramic infrared rotisserie back burner. This gives you a lot of versatility when it comes to cooking. You can easily have high and low temperature areas that will make cooking much simpler and effective. 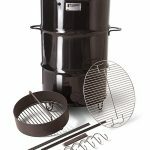 Add this into the fact that you also get the griddle, and smoker box and you suddenly have an almost complete cooking system. Overall, this is almost everything you could ever want from a grill. It has a huge range of features, meaning that it is very versatile and yet still simple enough for anyone to cook on. It even has a full width drip tray to make cleaning up easier than ever. This is our favorite overall natural gas built in grill and is a great option for someone not looking to have to spend thousands on a Lynx. Blaze Grills aim is to provide an affordable commercial style grill that is perfect for your outdoor BBQ needs. And they’ve done it, very well. At just over the threshold ($1,500) for being a low budget grill on our list the Blaze 40 Inch built in grill offers a lot of great features for a very reasonable price. It is fully built from 304 stainless steel, has 915 square inches of total cooking space and has a total of 80,000 BTUs. The build quality is very good and it manages to retain heat very well. It has a double lined lid with extra insulation to help with this. 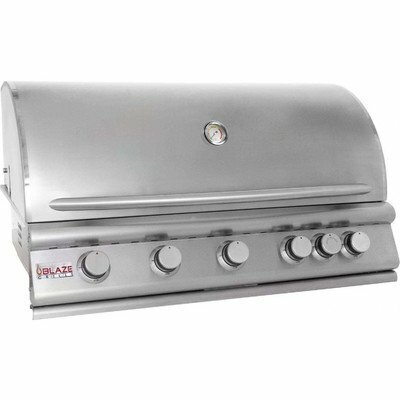 The Blaze 40 Inch Built-In Natural Gas Grill is a great option for someone looking for precise cooking options. 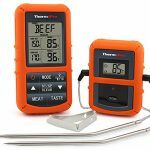 The ability to easily set up several cooking area temperatures will help people looking to cook multiple different cuts of meat at once. It’s very well built and has all the standard features you would expect a grill at this price to have, plus a few extra. Not only this, but it has a full lifetime warranty for that extra peace of mind. Lynx are like the Bugatti of built in grills. You get the very best quality built and the very best cooking experience on a Lynx. But it comes at a cost. The price of a Lynx can sometimes be as much as a car. 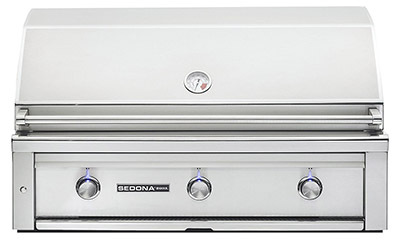 The Sedona series of grills by Lynx is also fairly basic in terms of features. There isn’t an included rotisserie system (optional extra) and there isn’t any fancy little extras like the Lion Gourmet Package. What you get it the highest quality basics you could ask for. You get 1049 square inches of total cooking area which includes cooling rack. 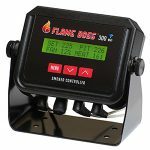 There are three burners, two standard stainless steel burners and a ProSear infrared burner giving a total of 69,000 BTUs. You may be wondering why we’re recommending such an expensive product that has so few features compared to other ones we’ve mentioned. The reason is that cooking on a Lynx is an absolute joy. The ceramic briquettes create a perfectly even heat distribution that makes cooking so easy. The ProSear system is stunning and can sear steaks perfectly in minutes. We think if you’re looking for the best cooking experience then Lynx grills can offer this, just be ready to pay premium prices. 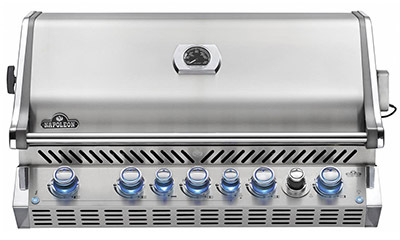 Napoleon’s Prestige Pro 665 Grill is the ultimate feature rich built in grill. It has 1150 square inches of cooking space and 7 burners with an extra infrared back burner for the rotisserie system. 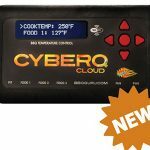 This gives you a huge variety of different cooking styles. You can have several different areas at different temperatures for cooking different meats. Overall, the Napoleon Prestige Pro 665 is one of the best built in BBQ grills that you can buy today. It has a huge range of features that make it perfect for almost any cooking scenario. The only downside we can see is that the assembly is a little complicated and can take some time. Like with all built in grills and outdoor kitchens, it is highly recommended to do a lot of research and make sure you know exactly to expect from the grill and take your time with the construction. If you do this, then the Prestige Pro 665 is a great grill to buy. When building an outdoor kitchen the grill is the most important part. 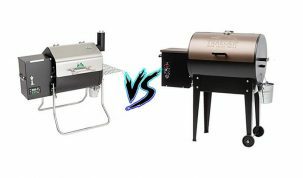 There are many on the market but you can certain that the ones we’ve recommended today are some of the best built in grills for the money. They will all make a great centerpiece to your outdoor kitchen and will almost certainly be the best grill you ever buy. If you go ahead a buy one of these grills, or already own one, let us know how you’ve got on with it in the comments below.